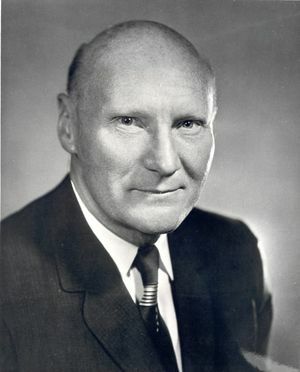 Ernst Weber, IRE President, 1959, IEEE President, 1963, was a pioneer in microwave technologies and long-time leader of the Polytechnic Institute of New York University (where he was President from 1957 to 1969). In 1945 he founded the Microwave Research Institute at the Polytechnic Institute (later renamed the Weber Research Institute in his honor). Ernst Weber was the first president of the Institute of Electrical and Electronics Engineers (IEEE) and one of the founders of the U.S. National Academy of Engineering. Weber was born in Vienna, Austria on 6 September 1901. Growing up in war torn Vienna did not stifle Weber’s interests in electrical engineering. He earned a B.S. degree in 1924 from the Technical University of Vienna and two Ph.D.’s, one from the University of Vienna in 1926 and another in engineering from the Technical University of Vienna in 1927. Doing research based on his mastery of mathematics and physics, he went to work for Siemens-Schukert in 1924. In the fall of 1930, he was invited to be Visiting Professor at the Polytechnic Institute of Brooklyn. A year later he was named a Research Professor of Electrical Engineering in charge of graduate study. Weber joined the IRE as a member in 1941, and was elevated to Senior member in 1943. From 1942 to 1945, he was Professor of Graduate Electrical Engineering and head of graduate study and research in that field. During World War II, he worked on radar and other military projects and also helped establish a company, Polytechnic R&D, (formerly with the Office of Scientific Research and Development,) which developed and manufactured microwave devices. In 1945, he was appointed Chairman of the Electrical Engineering Department and Director of the Microwave Research Institute at Polytechnic. Weber became a Fellow of the IRE in 1951. In 1957, Weber became the president of the Polytechnic University and held this position until his retirement in 1969. Weber is widely recognized for organizing a research group devoted to microwave research. Under his guidance, they developed the precision microwave attenuator, which was desperately needed for the accurate calibration of radar. Weber’s research organization founded in 1944, Polytechnic R&D, was granted over 30 patents. Weber also worked in the Institute of Radio Engineers (IRE) setting standards for radio equipment. Weber also played a large role in the merger of the IRE and the American Institute of Electrical Engineers (AIEE). Weber was a Fellow of both organizations and his leadership emphasized diversity and mutual support. Weber demonstrated that diversity was a source of strength and that having separate almost autonomous research groups was the secret of the organization’s strength. Weber’s administration of the merger earned him praise. He also allowed researchers to participate in the changes and committee formations. Weber’s leadership laid the foundation for the IEEE’s present structure of many technical societies within a profession society. Following his retirement in 1969 from the Polytechnic Institute Weber, who was named President Emeritus of Polytechnic, worked for the U.S. National Research Council for nine years. He published over fifty papers and two textbooks on electromagnetic field, linear and non-linear circuits, and microwave measurements. He also earned six honorary doctorates. Weber also served as President of the Institute of Radio Engineers (IRE) in 1959. In 1963, he became the first President of the IEEE when the AIEE merged with the IRE. Weber was presented with many awards during his life, including the U.S. Presidential Certificate of Honor in 1948, the Institute of Electrical and Electronics Engineers (IEEE) Founders Award in 1971 “for leadership in the advancement of the electrical and electronics engineering profession in the fields of education, engineering societies, industry and government,” and the U.S. National Medal of Science in 1987. Eta Kappa Nu named him an Eminent Member in 1962. Weber died 16 February 1996 in Columbus, North Carolina. He had two stepdaughters and was married to Sonya Weber. Weber and George H.W. Bush, 1987. Weber received the National Medal of Science from President Reagan in 1987. This photograph was taken after the ceremony. The 1988 Oral History with Weber on the ETHW contains extended discussion of his role in the early history of IEEE. The 1991 Oral History with Weber contains extended discussion of his education, and his career as an engineer and educator.